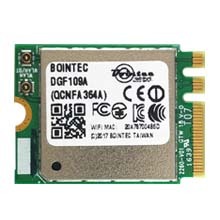 Bointec DGF109R IEEE 802.11 a/b/g/n/ac PCIE WIFI with Bluetooth 4.2 combo M.2 module is a highly integrated single-chip MIMO (Multiple In, Multiple Out) wireless local area network (WLAN) solution to let users enjoy the digital content through the latest wireless technology without using the extra cables and cords. 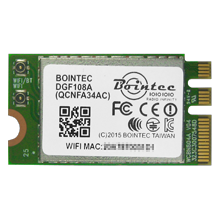 It combines a WLAN MAC, a 2T2R capable WLAN baseband, and RF in s single chip. 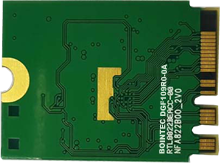 It enables a high performance, cost effective, low power, compact solution that easily fits onto the PCI Express and USB M.2 module. Maximum PHY data rate up to 173.3 Mbps using 20MHz bandwidth, 400Mbps using 40MHz bandwidth, and 866.7Mbps using 80MHz bandwidth. Wi-Fi Direct supports wireless peer to peer applications. CCA on secondary through RTS/CTS handshake. Maximum data rate 54Mbps in 802.11g, 300Mbps in 802.11n and 866.7bps in 802.11ac. 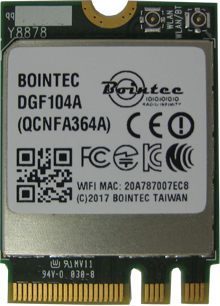 Bointec DGF109R baseband implements Multi-user Multiple Input, Multiple Output (MU-MIMO) Orthogonal Frequency Division Multiplexing (OFDM) with two transmit and two receive paths (2T2R). Features include two spatial stream transmissions, short Guard Interval (GI) of 400ns, spatial spreading, and support for variant channel bandwidth. 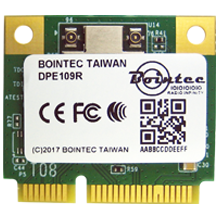 Moreover, Bointec DGF109R provides one spatial stream space- time block code (STBC), Transmit Beam forming (TXBF) and Low Density Parity Check (LDPC) to extend the range of transmission. At the receiver, extended range and good minimum sensitivity is achieved by having receiver diversity up to 2 antennas. 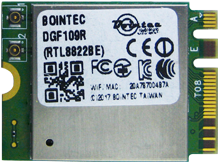 As the recipient, DGF109R also supports explicit sounding packet feedback that helps senders with beam forming capability.